As Alderman for your Ward, I thought I would write and bring you up-to-date with news. First, you should be receiving our Broad Street Ward Newsletter every six months. If not, or you would like to receive it electronically, please do contact me. A printout of our Ward website to remind you where to find or post local information, and the Broad Street Ward Club website to remind you that you’re welcome to join – your members, Deputy John Bennett, John Scott CC, Chris Hayward CC, and I, would be delighted to sponsor you. Refurbishment and all-but-pedestrianisation of Austin Friars. This project was completed, on budget, and on time. We have plans for more social and community activities in this area. Please do look out for a Ward Might later in the year, basically an open house in the centre of the Ward one lunchtime. Also look out next year for a street market. On-site shredder vans. An outright ban seems a ways off, but we have reduced these vehicles to almost the minimum. If you spot a particular offender, i.e., idling or unattended in a restricted parking area, please do feel free to photograph them and send to me. We are proud of the website, now in its fifth year. We also have a twitter account @broadstreetward. We are trying to ‘follow’ all businesses and people in the Ward, so please do ‘follow’ us by return! City & Ward Overview. 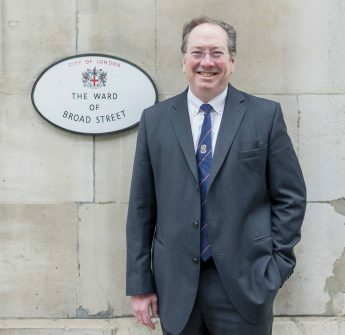 Your members are always ready to come to offices in the Ward to explain the City of London, the history, livery companies, wards, philanthropy, and local services. We have a presentation, “What Could The ‘City of London’ Ever Do For Me? Or How Can I Drive Sheep Across London Bridge?” we’d be delighted to give to you and your colleagues if you wish. The presentation also covers how to apply for the Freedom of the City of London, again, something where your members, Deputy John Bennett, John Scott CC, Chris Hayward CC, and I, would be delighted to sponsor voters. Equally, for a large party, we would be happy to host you at the Guildhall for such a presentation, along with a short tour. To request a City & Ward Overview, just email me at michael_mainelli@zyen.com. City Giving Day is taking place on 25 September 2018. It’s one day in the year when businesses can unite to celebrate and showcase their charitable and volunteering efforts with employees, clients, suppliers and the public. It is about celebrating what you already do – not asking you for money. To register, just go to thelordmayorsappeal.org/a-fair-city/city-giving-day. May I take this opportunity to thank you for your support. Your members are always open to ideas for change and improvement. It’s our honour to serve you. We want to continue trying to deliver more by Working for the City, Working for the Ward, Working for You.